Another thing that I simply love about this time of year: The fabulous variety of special occasion wear available at practically every retailer, varying from low-end to high-end. Yes Babes, now is the time to shop special occasion wear! Retailers are stocked to the brim with fits and accessories for just about any occasion that you can think of. 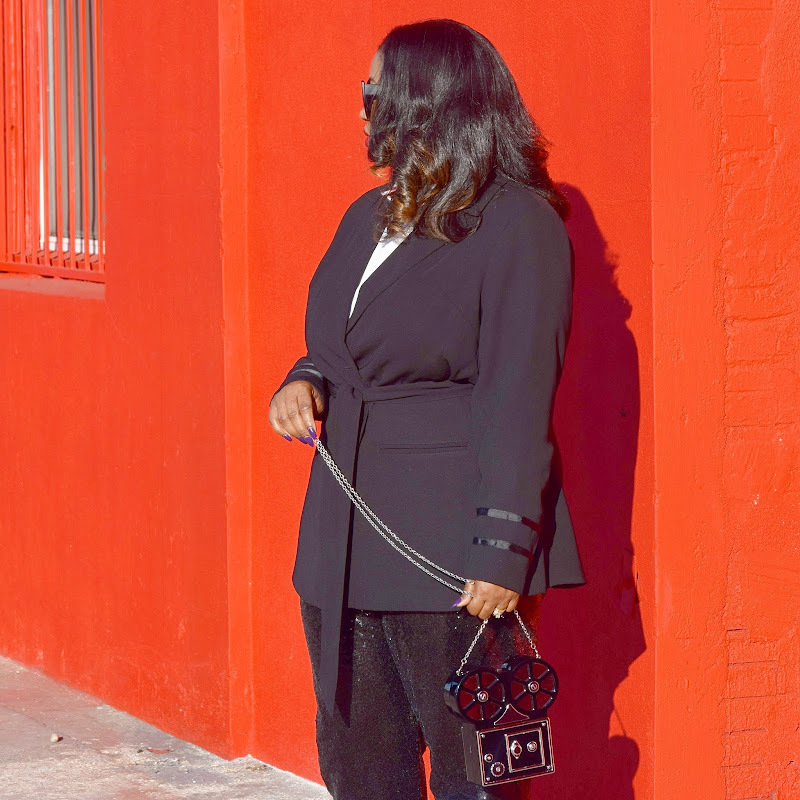 I always stock up on items that I may want to wear to venues throughout the following year (like weddings, outdoor parties, blogger events, etc), as stockpiles have a tendency to dwindle down to non existent after January. Today's look is a perfect alternative for a cocktail themed event. Perhaps you're like me and want to switch it up a bit- out of the typical LBD, sequin dress, or formal suit routine. 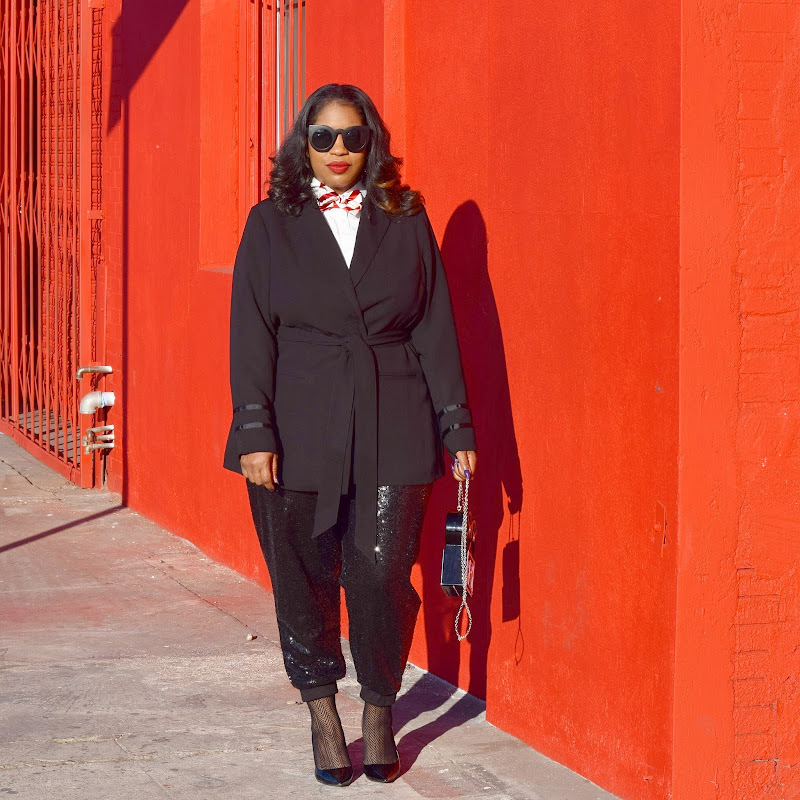 This jacket gives me a total tuxedo vibe, with a feminine twist by way of a tie at the waist. The sequin joggers are casual yet playful. Absolutely ❤ them! I added in a bow tie, fishnet stockings, and a novelty bag to seal the deal. Yes. . to all of it and I love how you styled them. Enjoy! This is such a fun holiday look! I love that purse! Joi you look stunning! I love it from hat to toe. Love the entire look and that handbag is so cute and fun. Thanks for sharing on the link up over at A Pocketful of Polka Dots' Fabulous Friday. I love those sequin pants, I feel like I would grab them for an event instead of a dress. I love being comfortable and stylish! Comfort and stylish is a winning combination IMO ;) Thank you Laura!! 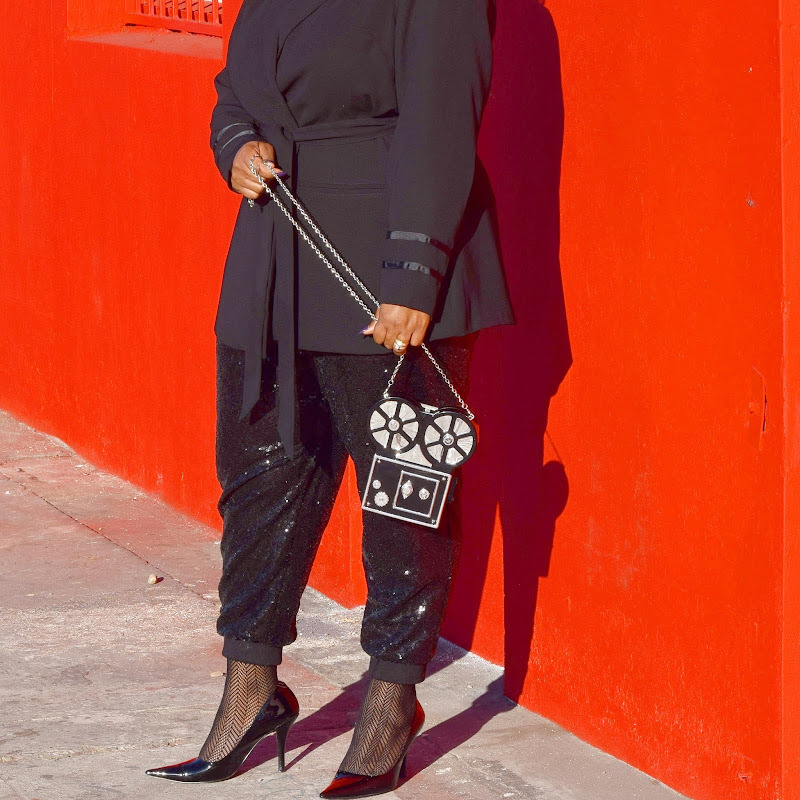 Very inventive Joi1 Love the pants, your adorable bag and the whole look is fab! 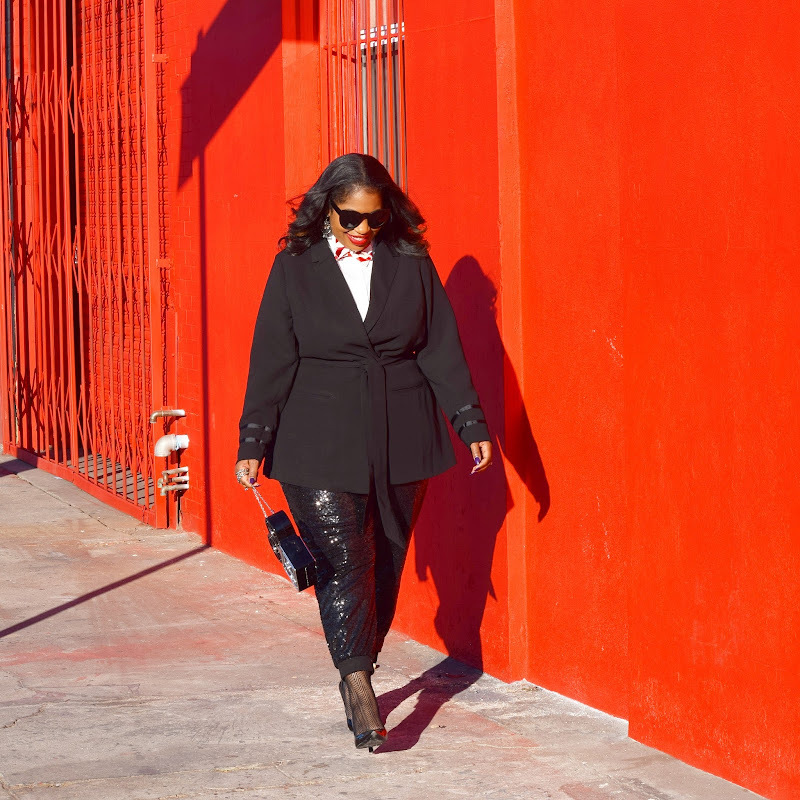 Thanks for linking up your awesome outfit post at the Top of the World Style linkup party. these sequin joggers are stunning. Love your styling. Those sequin pants are amazing! 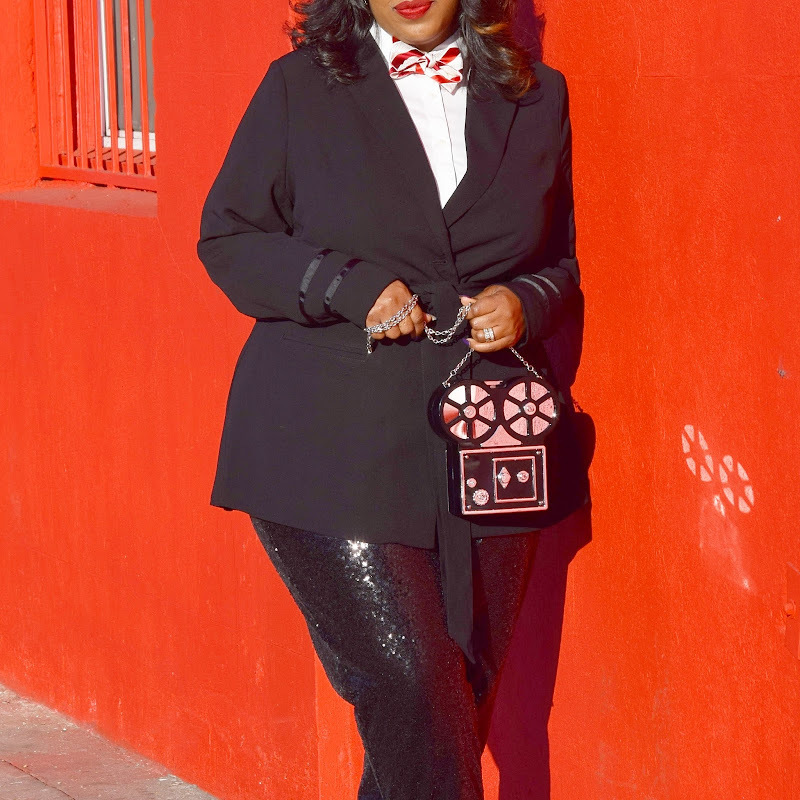 I love the bowtie and movie reel bag! 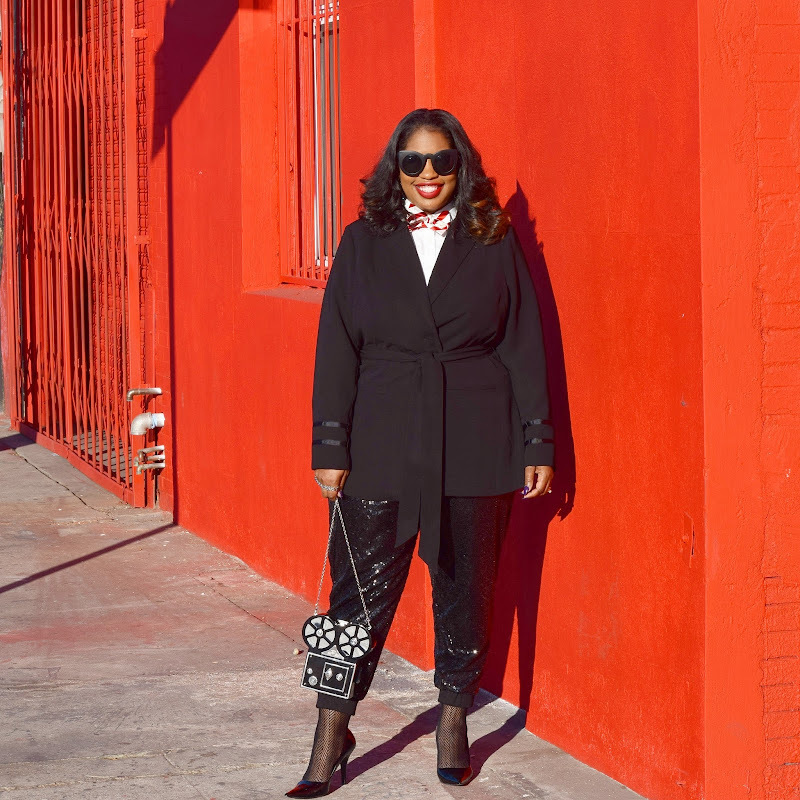 Fabulous outfit Joi, thanks for linking up!